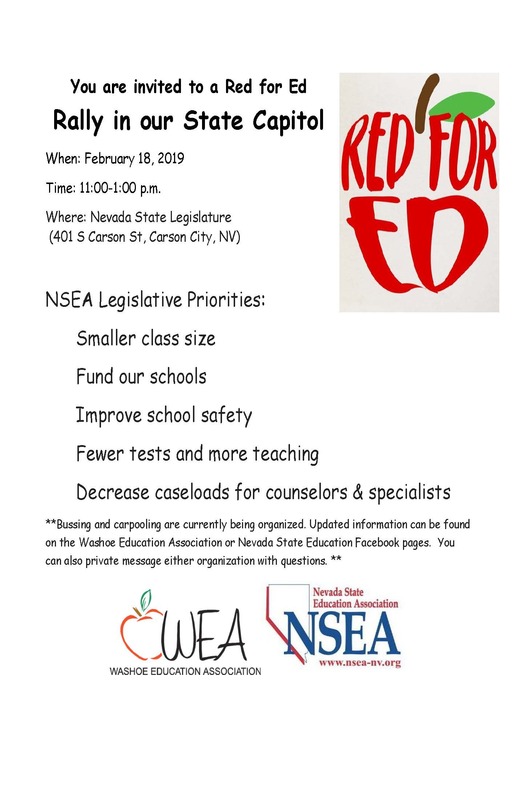 Because of the large number of people we are expecting to attend the rally, we are asking all WEA members who will be attending, to register via the link sent to your WCSD email address,by Thursday, February 14, 2019. This will allow us to coordinate logistics and transportation for the rally. For those who will be driving down in their own vehicles, but who would like to caravan to the rally, we will be leaving for the rally from the southeast parking lot of Wooster High School (1331 East Plumb Lane, Reno, NV 89502) at 10:10 AM sharp. Also, for those WEA members who would like to ride a bus to the rally, our sister association of WESP has reserved 3 WCSD school buses. In order to ride one of the buses, registration at the above link is required. Riding on the bus will be on a first come first served basis, based on those who register. Again, we are asking that all WEA members who will be attending the rally to register at the link sent to their WCSD email address, and that they register no later than Thursday, February 14, 2019.